We all spend an average of 8 hours a night sleeping, so it is safe to say that the majority of us spend most of our time in the bedroom. Spending so long in one room can cause us to doubt the room’s current décor – leaving us daydreaming about new layouts and fancy colour schemes. However, a full bedroom redecoration can generally end up pulling tightly on those purse strings! Giving your bedroom a new lease of life doesn’t have to break the bank. If your bedroom already has quite neutral coloured walls, adding bright bedroom accessories every here and there will give the room a new look while adding stylish pops of colour. Accessories that you might choose include brightly coloured photo frames or vibrantly painted vases. The bed is the centrepiece to any bedroom. To make sure your bedroom has that stylish look, give your bedspread an update! Whether you choose a plain coloured bedspread that you can update with bright cushions, or fancy adding a statement splash of pattern to your room with a printed bedspread, at TJ Hughes we have got a great selection of cheap bedding and bed in a bag sets. 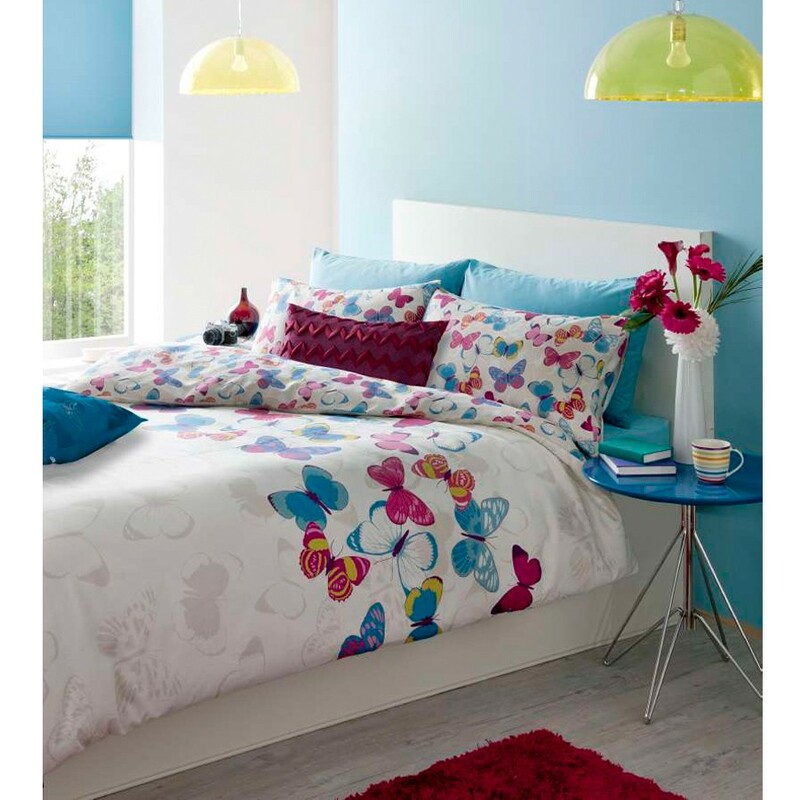 One of our favourite duvet covers that will revamp any room is the Catherine Lansfield Butterfly Fusion Set – the colourful butterflies will add style and charm to any bedroom. Redecorating an entire room can be pretty pricey but one way of instantly revamping your bedroom is to wallpaper one wall of the room. A statement wall will act as a nice focal point in the room while working as a colour scheme for buying bedding, cushions and bedroom accessories for that stylish finish. How will you revamp your bedroom? We would love to hear any bedroom budget tips!